Heat oven to 425 F. Slice ½" top off garlic bulb and drizzle with olive oil. Wrap in aluminum foil. Bake until garlic is soft and golden, about 45 minutes. Remove from oven. When until cool enough to handle, peel garlic cloves, mince and set aside. In large pot, add potatoes and cover with water and ¾ teaspoon of salt. Bring to a boil then reduce heat and simmer, uncovered, until tender, about 15 to 25 minutes. 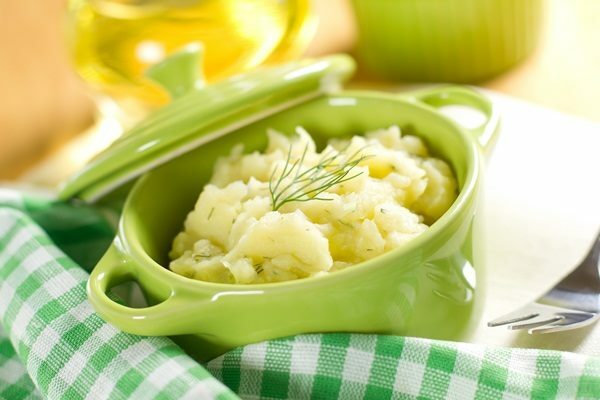 Drain potatoes and mash until smooth in a large bowl. Mix in garlic. Cover and keep warm. Heat soy milk and salt and pepper in a small saucepan over medium-low heat (do not boil). Mix in miso and whisk to combine. Pour over potatoes and combine. Adjust salt and pepper to taste. Garnish with chives or green onions. Serve immediately.